The staff here at A Kids Book A Day will be camping for a week. In the A Kids Book A Day family, “camping” means sleeping in tents, and does not–some would say, unfortunately–involve any sort of generation of electricity. So blog postings will be suspended for the duration. We will return to our regularly scheduled programming next Monday. Summary: Zomorod is starting sixth grade in Newport Beach, California, the latest stop on her family’s shuffle between their native Iran and her father’s petroleum engineering jobs in California. It’s not an easy transition, but Zomorod knows one step she can take to help herself—change her name to Cindy. Middle school has its ups and downs, but Cindy makes some good friends, is at the top of her classes, and finds herself enjoying life in America. It’s 1978, though, and as events in Iran deteriorate, so does Cindy’s life. The anti-Iranian sentiment peaks with the taking of American hostages, and Cindy’s father’s job gets cut. No one is hiring Iranian engineers, and as the crisis in Iran drags on, Cindy finds herself withdrawing from her friends. Finally, the family is out of savings, and it looks like they will have to go back to Iran—an Iran they hardly recognize anymore under the Ayatollah Khomeini. Just as things are bottoming out, help comes from a most unexpected source, and Cindy’s friends and neighbors show her that kindness is an international virtue. 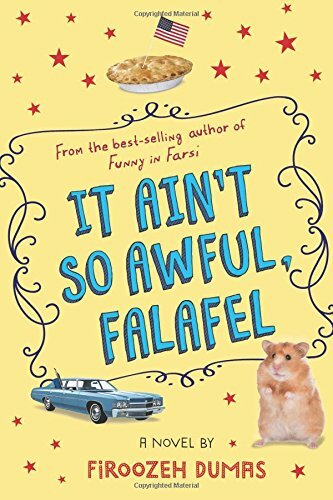 An author’s note tells about the semi-autobiographical nature of her story and introduces the Falafel Kindness project. 384 pages; grades 4-7. Pros: If Judy Blume were an Iranian immigrant and didn’t write about puberty issues, she might sound something like this. Cindy’s story is a perfect blend of middle school girl story, historical fiction, and lessons in compassion. Cons: When events from your own high school days are categorized as “historical fiction”. Summary: Young Dorothea was a keen observer, often feeling like an outsider after a childhood bout of polio left her with a limp. At the age of 18 she decided to become a photographer, even though she had never handled a camera. She worked in a number of studios, first in New York, then in California, where she learned the art of taking pictures, eventually setting up her own portrait studio in San Francisco. But she felt unfulfilled taking photos of wealthy people. In the midst of the Great Depression, she took to the streets, photographing the poor and neglected, traveling across the country, and waking people up to the poverty that was sweeping the nation. 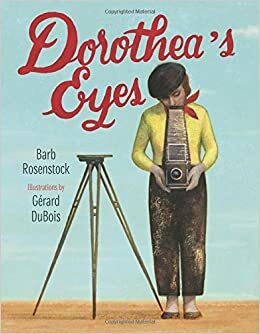 Although she was plagued with ill health for many years, Dorothea continued to be a crusader with her camera, both in the United States and abroad. End matter includes several of Lange’s photographs, an author’s note, a timeline, and resources for further research. 40 pages; grades 1-5. Pros: An interesting biography of an inspiring woman who followed her heart to do work that made a difference. The unique illustrations have an appropriately vintage feel to them. Cons: I really liked Dorothea Lange’s quote on the bibliography page. Too bad it couldn’t have been worked into the text. Summary: Many years ago, in Morocco, people were sustained by the cool water of their fountains and the refreshing tales of their storytellers. As life got easier, though, the storytellers began to die out; at the same time, the fountains started to dry up. When a young boy goes in search of water, he finds a storyteller perched on the edge of a dried-up fountain. 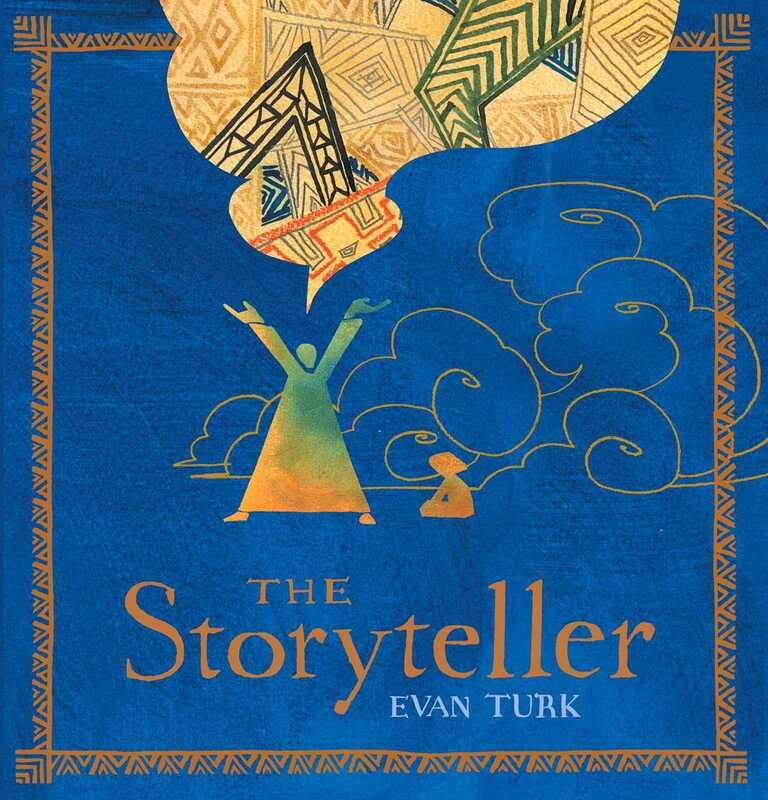 After listening to the storyteller’s captivating tale, the boy finds his cup is full of water. Each part of the story ends with a cliffhanger, and the boy returns each day until the fountain is full again. When a djinn from the Sahara desert threatens to destroy the drought-stricken city, the boy becomes the storyteller, keeping the djinn at bay until the people of the town unite to fill all the fountains and save their city. An author’s note tells of Morocco’s storytellers, whose traditions have been being replaced by TV and the Internet, and a recent move to preserve their art. 40 pages; grades 1-5. Pros: A beautiful tale that explores the power of stories in humans’ lives. 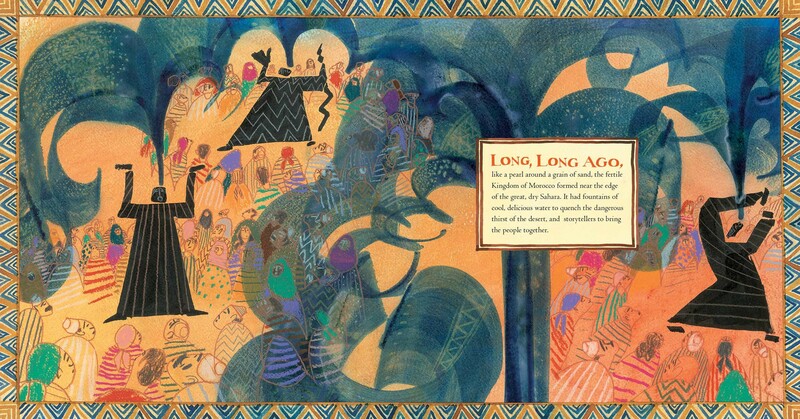 The unique blue-and-gold themed illustrations may put this book on the Caldecott contenders’ list. Cons: A little difficult to classify the genre; while it has the feel of a folktale, it is not a traditional story. 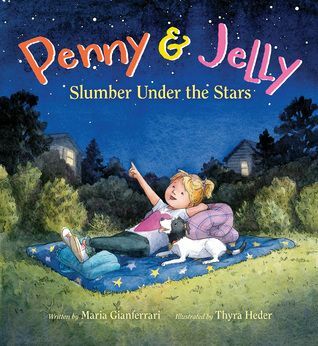 The publisher calls it “an original folktale”. .
Summary: Penny is excited about the upcoming “Sleepover under the Stars” sponsored by the local recreation department. As she gets ready, though, she notices the “No pets allowed” line on the flyer, and is sad that she can’t take her dog, Jelly. She tries different ways to make a Jelly to take with her, using paper, yarn, fleece, and a host of other materials. Nothing is as satisfactory as the real thing. Finally, Penny and Jelly put their heads together and come up with the perfect solution. Penny gets on the phone and calls her friends, and they have their own sleepover under the stars in Penny’s backyard, complete with pets. 32 pages; ages 4-7. Pros: A companion to last year’s Penny & Jelly: The School Show, this is an engaging slice-of-life tale of a girl and her dog. Penny is a resourceful girl who works to solve a problem without any adult help. Cute illustrations and a satisfying end. Cons: What Penny’s room must look like after creating a marshmallow Jelly, a shaving cream Jelly, and a jelly Jelly. 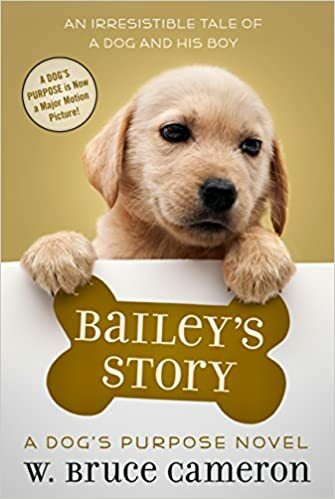 Summary: Bailey is born on a puppy mill, but his sense of adventure leads him into the world on his own. He’s picked up by a truck driver who leaves him in a locked truck on a warm day. Rescued once again, he ends up with Ethan, an eight-year-old boy who soon becomes his best friend and constant companion. Through their years together, Bailey learns how to take care of Ethan, saving him from real and imagined dangers. A neighborhood bully named Todd is part of Ethan’s life, first as a friend, but gradually becoming a dangerous enemy. His final act of revenge against Ethan and his family sets the stage for Bailey’s greatest act of heroism. This is the second book in a series adapted from Cameron’s adult novel, A Dog’s Purpose. 208 pages; grades 3-6. Pros: Told in Bailey’s voice, the story is by turns funny, touching, and exciting. The adorable cover will catch the eye of dog lovers, and they won’t be disappointed by the rest of the book. Cons: This seemed like a contemporary story except for two brief, and seemingly unnecessary, references to the Apollo 11 moon landing. Summary: Charlie is trying to save money to buy a new dress for her Irish step dance competition, so when her friend Drew invites her to go ice fishing to make some money, she agrees. The only fish she catches is too small to sell, but to her amazement, the fish speaks. “Release me,” it says, “and I will grant you a wish.” Skeptical, she gives it a try, and in the next day or so, realizes her wish has come true. She returns to the hole several more times, making wishes to help her friends, but, predictably, the wishes go awry, and Charlie vows to stop. Then comes a phone call that turns Charlie’s world upside down. Her sister Abby, a college freshman, is addicted to heroin. She has to leave college and enter a treatment center. After much careful thought, Charlie makes one last wish for Abby. It seems to be working until Charlie’s dance competition. 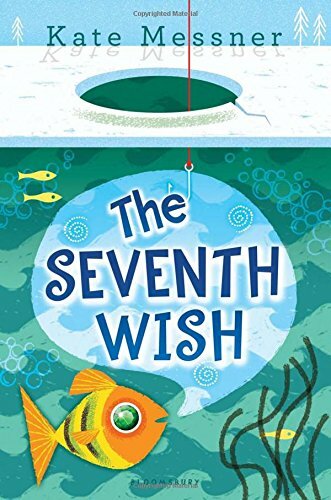 It’s a day of triumph for Charlie until Abby disappears, and Charlie has to learn that all the wishes and magic in the world can’t help someone who doesn’t want to be helped. 240 pages; grades 4-7. Pros: Charlie is an engaging protagonist, and the story lines about the fish and her dance competitions add some lighthearted notes to a sad and weighty topic. The issue of addiction of a family member is handled realistically, and Charlie’s ultimate realization that she can’t save her sister and must live her own life as best she can is a good message for kids to hear. Cons: The cover and first few chapters make this feel like a much lighter read than it turns out to be. Some kids in the recommended age group may not be ready for the subject of addiction…or parents may be concerned that they’re not ready for it. Preview before sharing with young readers.